WASHINGTON, D.C., September 5, 2017 — Water has many ice phases that form under different pressure and temperature conditions. The effects of positive pressure have been explored extensively, with the results somewhat predictable: As the pressure increases, so does the density of the ice. Much less is known, however, about the effects of extreme negative pressure on water molecules. Exploring a significant region of negative pressure through molecular dynamic simulations, researchers have now theoretically discovered a new family of ice phases. Called aeroices, these ices have the lowest density of all known ice crystals. The researchers, from Okayama University in Japan, report their findings this week in The Journal of Chemical Physics, from AIP Publishing. "Our research, which surveys an entire negative-pressure region for the first time, provides a significant stepping stone in exploring this vast and intricate territory on the phase diagram," said Masakazu Matsumoto, associate professor at the Research Institute for Interdisciplinary Science at Okayama University and a co-author of the paper. "Ices with lower density than normal ice are also found to be manifold [of many kinds]." The discovery is expected to accelerate the understanding of the fundamental properties and behavior of water in nanotubes and other nanopores, as well as in biomolecules. Seventeen ice phases have been found experimentally, each one numbered in the order of its discovery. Only two ices have lower density than normal ice. In 2014, a research team discovered an ice phase that forms under negative pressure: ice XVI. The molecules of the ice form a zeolite structure, a 3-D crystalline cage, in which guest molecules or atoms are trapped inside. The guest molecules (neon particles in this case) were removed, resulting in a stable, ultralow density ice at high negative pressures. Using a similar technique, another group of researchers discovered ice XVII in 2016. The researchers at Okayama University mapped out all the possible ice phases that might still be left to explore in the negative pressure region. Knowing that the structure of silica (SiO2) and ice are common, they retrieved 200 silica zeolites from the Zeolite Database, which is administered through the International Zeolite Association. More than 300 structures were evaluated overall. The researchers rearranged the atoms in the SiO2 structure, removing the two oxygen atoms and replacing the silicon atom in each molecule with one oxygen atom. Then, the hydrogen atoms were added so that the structure obeyed the ice rule. In the density range that is only around half that of liquid water (~0.5 g/cm^3), the researchers showed that the newly discovered ice phase is more stable than any zeolite ice investigated so far. The researchers simulated even less dense ice structures — between 0 and 0.5 grams per cubic centimeter — by adding polyhedral building blocks to the zeolitic frameworks to make the structure sparser while satisfying the structural rule for ice. 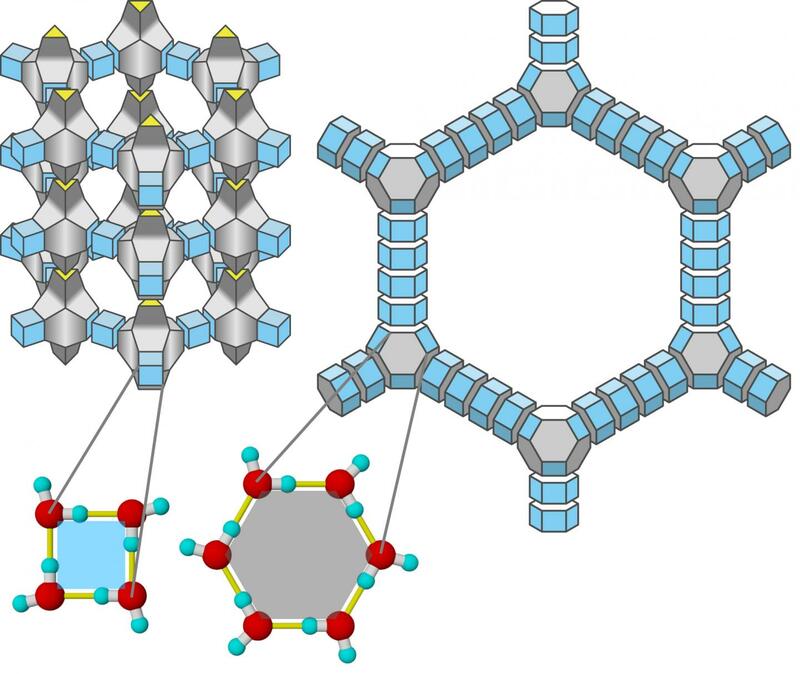 "These new structures are the aeroices," said Matsumoto, "and they can be more stable than any zeolitic ice at certain thermodynamic conditions under negative pressure." The article, "Communication: Hypothetical ultralow-density ice polymorphs," is authored by Takahiro Matsui, Masanori Hirata, Takuma Yagasaki, Masakazu Matsumoto and Hideki Tanaka. The article appeared in The Journal of Chemical Physics Sept. 5, 2017 (DOI: 10.1063/1.4994757) and can be accessed at http://aip.scitation.org/doi/full/10.1063/1.4994757.